I’ve been struggling since last September, stuck in the same stone all that time just going up and down, up and down like a yoyo. It was starting to get me down but I never let it get to me so much that I stopped going and I’m really proud of myself for that. I’ve been overweight my whole life and tried numerous diets with no success, mostly because i didn’t stick with them when I had bad weeks. I wouldn’t put them behind me and move on, I’d get fed up and give up. Slimming World worked straight away and I lost 7 stone in my first year so I know it works for me. I don’t know why it’s not been working lately but I do know I feel positive again and because I didn’t give up, I didn’t put all the weight back on, which I could have easily done so I don’t have to start all over again! 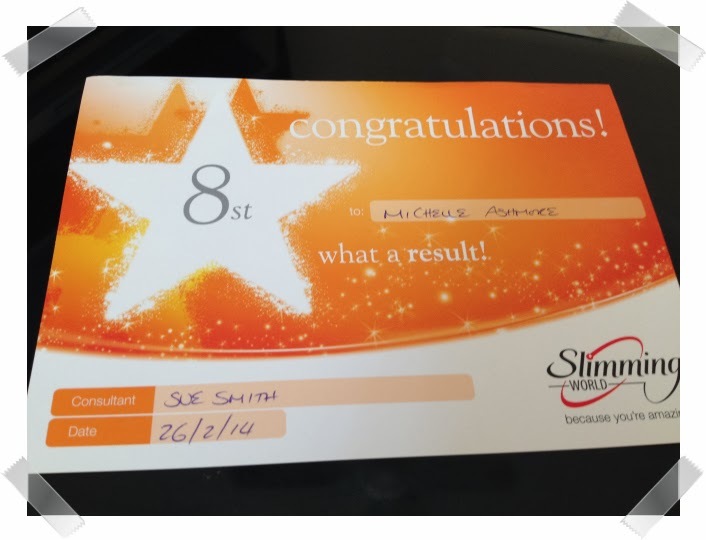 I was losing a stone every 6-9 weeks until my first anniversary when I received my 7 stone award then it took 27 weeks to get my 8 stone award. Tonight I made some homemade burgers, slimming world style and they were so delicious I wanted to get the recipe posted so I don’t lose it! Today I got weighed at my Slimming World class. The last time I got weighed at my SW class, I’d put 10lb on over the Christmas week. I expected it and had mentally prepared for it so I was fine but I also wanted to get it off as quickly as I could. I sent all the Christmas goodies to Derbyshire with the children and got right back on track after my weigh in on the 29th December. I’ve been food optimising 100% since the 29th and when I got on the scales today I was delighted to be told that I’d lost 10 and a half pounds! It felt like we could finally relax because now it’s all legal. I arranged our buildings insurance which was a first for me; I’ve never had to have buildings insurance before and it made me feel all grown up! I’ve been doing Slimming World for nearly 15 months and during my first year I lost 7 stone. I still have another 11 and a half stone to go to get my target of 12 stone but even though it’s a huge amount, I wasn’t worried. I’d been happy with my losses during the first year and expected it to take me to the middle of 2015 to get to target. Since August though, my weight loss has slowed significantly and for the past 2 weeks I’ve gained with no knowledge as to why. I was doing a photo diary of all my meals on my other blog, Quest of a Shrinking Lady, and when I compared recent photos to other weeks where I’ve had good results, there wasn’t much difference. I stopped taking photos because I figured I needed to try and follow the plan without keeping a diary as the aim is to change your lifestyle and work the plan in, not make it the focus of your life. I’m now wondering if this was the right thing to do because things haven’t been going so well since I stopped. I’m starting to get really disheartened because it feels like I’m wasting money on this now. Since my 1 year anniversary I’ve only lost 8lb but I’ve put 3.5lb back on so that means I’ve spent the last 2 losing less than 5lb and when you’re used to losing a stone every 6-8 weeks, 2 months losing only 4.5lb is quite upsetting. The worst thing is not knowing what I’m doing wrong because if I knew, I could put it right. I’m doing an S.A.S. log this week. For those who don’t know, it’s an in depth diary of everything I eat and it makes you really assess your choices. Fingers crossed that I can turn this around because I know from experience that when I stop getting the results, I stop trying and I can’t afford to stop this time. I’ve never stuck at any diet before the way I have with this one and I’ve never lost more than 2-3 stone before giving up. I can’t go back. I never ever want to be 31 stone again so I have to do something. I’ve got 6 weigh ins before Christmas. I really want to get my 8 stone award before then so if I can just lose 2lb a week, I’ll do it. Cowboy Pie This is my own take on a recipe I saw in one of the Slimming World magazines. Please check syn values for yourself; I’m not a trained consultant and I don’t work for Slimming World. I started Slimming World a few weeks ago (you can see my progress on my other blog, Quest of a Shrinking Lady!) and the thing I’m struggling with the most is not, as you would think, having to limit my intake of chocolate, crisps and cakes, it’s trying to fit the cost of all the fruit, vegetables and lean meats that the diet calls for, into the weekly grocery budget; I’m finding that it’s not cheap to eat healthily. I know this ‘diet’ (it doesn’t feel like a diet at all!) is wonderfully healthy for the whole family because we’re all eating more than the recommended five portions of fruit and vegetables a day but I’m not sure how we’re going to keep up with the cost of it! I had thought that not buying all the crisps, desserts and unhealthy snacks that I used to, would offset the cost of the fruit, veg and meats but when you look at it, a packet of 5 chocolate chip cakes from Tesco can cost as little as 50p; we usually buy Tesco Value anyway so the cost of those cheap treats doesn’t compare to the cost of the healthy things we now have to buy. I used to buy the cheapest cuts of meat but now we have to have the leanest; obviously, the more work they have to do to prepare the food pushes the prices up. I now have to buy pork mince to make homemade sausages rather than buy a bag of 20 frozen ones. And yes, I do know that homemade are 100% better for us but we don’t have the income to be able to choose the healthiest options all the time and a bag of 20 sausages does 2 meals for £2 whereas a pack of lean pork mince does 1 meal for £4. Just that one comparison shows the huge difference between the cost of meals on our new way of eating but somehow, I have to make this work because it’s best for us all in the long run. I see a lot of Slimming World recipe research is in order to find healthy, tasty meals that can be made for a smaller cost.